Hard to take photos for Skywatch when the sky is always such a clear pretty blue. All right, the sky isn't always clear blue, but it was last Saturday. 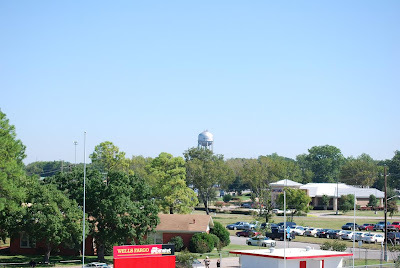 This was taken from the press box of Memorial Stadium. For Skywatch from around the globe click here. The football Tigers are looking to rebound tonight at home against the Mabank Panthers. Cliff has his preview of the game here. My week 4 NFL picks. xJacksonville 1-2 (Home: 0-1) One win between them, that wasn't expected. xWashington 1-2 (Home: 1-0) Can I pick both teams to lose? xNew Orleans 3-0 (Home: 1-0) Early season showdown, should be a great game. xDenver 3-0 (Home: 1-0) Yes I am picking against the Cowboys. xGreen Bay 2-1 (Road: 1-0) Game of the week, or hyped game of the week?